Enhanced interrogation techniques is a euphemism for the U.S. government's program of systematic torture of detainees by the Central Intelligence Agency (CIA), the Defense Intelligence Agency (DIA) and various components of the U.S. Armed Forces at black sites around the world, including Bagram, Guantanamo Bay, and Abu Ghraib, authorized by officials of the George W. Bush administration. Methods used included prolonged stress positions, hooding, subjection to deafening noise, sleep deprivation to the point of hallucination, deprivation of food, drink, and withholding medical care for wounds — as well as waterboarding, walling, nakedness, subjection to extreme cold, confinement in small coffin-like boxes, and repeated slapping or beating. Several detainees endured ""rectal rehydration,"" ""rectal fluid resuscitation"", and ""rectal feeding."" 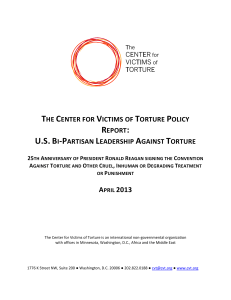 In addition to brutalizing detainees, there were threats to their families such as threats to harm children, and threats to sexually abuse or to cut the throat of, detainees's mothers.There has never been an authoritative tally of the number of detainees subjected to these methods, or of how many died under torture. The CIA admits to waterboarding three people implicated in the September 11 attacks: Abu Zubaydah, Khalid Shaikh Mohammed, and Mohammed al-Qahtani, and (although not admitted) the agency waterboarded Abd al-Rahim al-Nashiri; photos show a waterboard surrounded by buckets of water at the Salt Pit, a CIA prison where the CIA claimed never to have used the technique. Three reported suicides at Guantánamo are alleged to have been homicides under torture; no criminal charges have been brought for these or for acknowledged torture related homicides at Abu Ghraib and at Bagram.Debates arose over whether ""enhanced interrogation"" violated U.S. anti-torture statutes or international laws such as the UN Convention against Torture. In 2005 the CIA destroyed videotapes depicting prisoners being interrogated under torture; an internal justification was that what they showed was so horrific they would be ""devastating to the CIA"", and that ""the heat from destroying is nothing compared to what it would be if the tapes ever got into public domain."" The United Nations special rapporteur on torture, Juan Mendez stated that waterboarding is torture — ""immoral and illegal,"" and in 2008, fifty-six House Democrats asked for an independent investigation.American and European officials including former CIA Director Leon Panetta, former CIA officers, a Guantanamo prosecutor, and a military tribunal judge, have called ""enhanced interrogation"" a euphemism for torture. In 2009 both President Barack Obama and Attorney General Eric Holder stated certain of the techniques are torture, and repudiated their use. They declined to prosecute CIA, DoD, or Bush administration officials who authorized the program, while leaving open the possibility of convening an investigatory ""Truth Commission"" for what President Obama called a ""further accounting. ""In July 2014, the European Court of Human Rights formally ruled that so-called ""enhanced interrogation"" is torture, and ordered Poland to pay restitution to men tortured at a CIA black site there. In December 2014, the U.S. Senate made public around 10% of a report about the CIA's use of torture during the George W. Bush Presidency. See: Senate Intelligence Committee report on CIA torture.